Investigators checking the validity of Disabled Persons Parking Placards on vehicle parked outside the L.A. County Fair last weekend issued 71 tickets for fraudulently using the parking passes, authorities said. A suspect in a Covina burglary was arrested in Pomona Thursday after the victim spotted one of the items stolen from her home — a rare card from the collectible trading card game Yu-Gi-Oh which she designed — for sale online, authorities said. Officers carried out a search warrant at around 10 a.m. at a home in the 500 block of East Pasadena Street in Pomona. They arrested Jennifer Gomez, 23, of Pomona, on suspicion of burglary and receiving stolen property, according to Covina police officials and Los Angeles County booking records. Gomez was taken into custody without a struggle, Covina police Lt. Ric Walczak said. The burglary was first discovered on Oct. 25, 2016, when the victim returned home from a vacation and found her apartment in the 1100 block of N. Conwell Avenue had been broken into, according to the lieutenant. Jewelry and various valuables were stolen from the apartment, including a rare, autographed, framed trading card from the popular Japanese card came Yu-Gi-Oh, Walczak said. The card, described as a “Gagaga Cowboy”card, is valued at about $500. But the sentimental value attached to the cars was invaluable, Covina police Detective Ivan Ostarcevic said. The victim, a successful artist and graphic designer, had personally designed the card. “Our victim is actually the person who designed the card. She drew it,” the detective said. A break in the case arose recently when the victim spotted the rare collectible card listed for sale on the online marketplace, OfferUp, Walczak said. “Detectives were able to establish that the seller of the stolen property had been a neighbor of the victim at the time of the crime,” police said in a written statement. Investigators went to the suspect’s home in Pomona on Thursday, armed with a search warrant. “Items stolen during the burglary were recovered during the search warrant service included jewelry and (the) trading card,” according to the statement. Of an estimated $4,000 worth of goods stolen in the October break-in, police recovered about $1,000 worth of items from suspect’s home, Walczak said. The remainder of the victim’s property remained unaccounted for. Adding insult to injury, the victim had shown significant generosity to the alleged burglar, Ostarcevic said. When she moved out of state, in part because of the break-in, she gifted her neighbors about $1,000 worth of housewares, such as bedding and plates, the detective said. Months later, she would learn the same neighbors were allegedly responsible for the burglary. Gomez was being held in on $50,000 bail pending her initial court appearance, scheduled Tuesday in the West Covina branch of Los Angeles County Superior Court. POMONA >> A fight in downtown Pomona early Sunday left two men wounded, authorities said. Two men in their early-20s suffered injuries not considered to be life threatening in the melee, which unfolded just before 2 a.m. in the 100 block of East Second Avenue, just east of Garey Avenue, Pomona police officials said in a written statement. The suspect or suspects remained at large, and no description was available, officials said. No further details were released regarding the circumstances of the stabbing, which police were investigating as attempted murder. Anyone with information is asked to contact Pomona police at 909-620-2085. Tips may also be submitted anonymously to L.A. Regional Crime Stoppers at 800-222-8477. 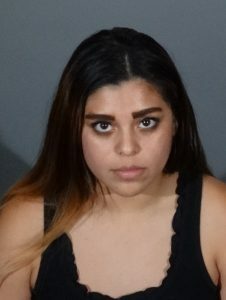 POMONA >> Police have arrested a 20-year-old woman following the fatal stabbing of her boyfriend early Friday at their Pomona home, authorities said. Officers were called to the 2200 block of West Valley Boulevard just after midnight for reports of an assault, Pomona police Lt. Ron McDonald said. The victim, a 21-year-old man, was stabbed in their home, Sgt. Bert Sanchez said in a written statement. “Emergency personnel attempted life saving measures, but were unsuccessful and the victim was pronounced deceased at the scene,” he said. Shaqcore Dalvin Prawl died at 12:31 a.m., Los Angeles County Department of Medical Examiner-Coroner Assistant Chief of Operations Ed Winter said. “During (detectives’) investigation, it was learned that a domestic violence incident occurred between the suspect and her boyfriend,”Sanchez said. “During this incident, the victim was stabbed. Police arrested Chayenne Capri Lywood, 20, on suspicion of murder, according to Pomona police officals and Los Angeles County booking records. Lywood was being held in lieu of $2 million bail pending her intitial court appearance, scheduled Tuesday in the Pomona branch of Los Angeles County Superior Court, records show. No further details were released. Anyone with information was urged to contact Pomona police at 909-620-2085. Tips may also be submitted anonymosuly to L.A. Regional Crime Stoppers at 800-222-8477. POMONA >> A Pomona man died following a shooting that erupted during a family party at his home on Friday night, authorities said. Joseph Ellis Aguilar, 23, died at a hospital shortly after the 11:45 p.m. shooting at the corner of McKinley and Towne avenues, according to Pomona police Sgt. Bert Sanchez. Paramedics treated Aguilar and took him to Pomona Valley Hospital Medical Center, where he succumbed to his wounds shortly after arriving, officials said. Public records indicated Aguilar lived at the home where the shooting took place. Anyone with information was urged to contact Pomona police at 909-620-2085. Tips may also be submitted anonymously to L.A. Regional Crime Stoppers at 800-222-8477. 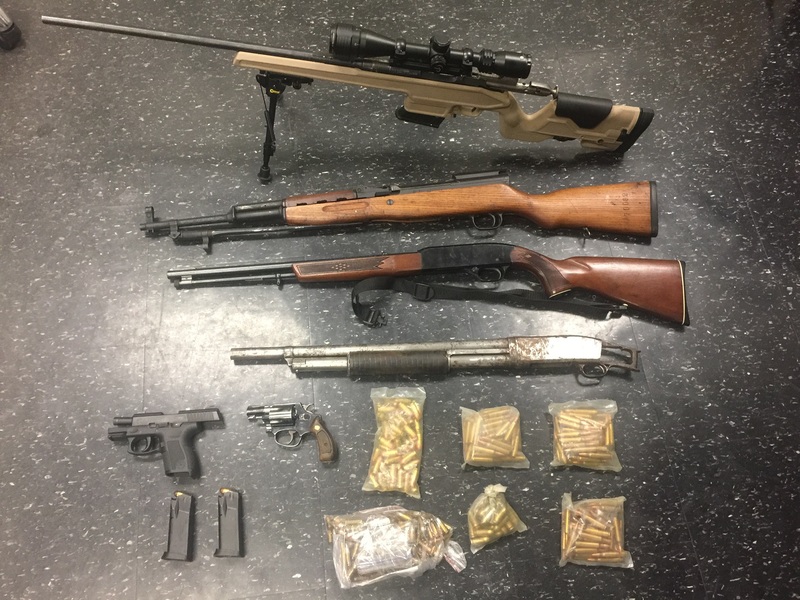 POMONA >> A police task force carried out a raid at a Pomona home Friday, resulting in the seizure of six guns, 500 rounds of ammunition and five pounds of marijuana from a convicted felon. Joseph Michael Cesena, 39, was boked on suspicion of being an ex-felon in possession of a firearm following his arrest, which took place shortly after noon at a home in the 2500 block of Cathy Avenue, Cpl. J Martinez of the Pomona Police Department’s Major Crimes Task Force said in a written statement. “During the service of the warrant, Officers located six firearms in the residence in addition to over 500 live ammunition rounds (various calibers) and over five pounds of marijuana,” Martinez said. The seized weapons included two pistols, a shotgun and three rifles. San Bernardino Superior Court records show Cesena was convicted of felony domestic violence in 2011, and is therefore barred from possessing firearms or ammunition. According to Los Angeles County booking records, Cesena was released from custody Friday afternoon pending his initial court appearance after posting a $35,000 bond. “It is the continued mission of the Major Crimes Task Force to seek out and apprehend individuals involved in gang and violent related criminal activity,” Martinez said. “The MCTF is dedicated to the safety of our citizens through the reduction of gang violence throughout our community by proactive and preventative enforcement. Anyone with information is urged to contact the task force at 909-620-2148. Tips may also be submitted anonymously to L.A. Regional Crime Stoppers at 800-222-8477. POMONA >> Police have made an arrest in the fatal shooting of 8-year-old Jonah Hwang in Pomona last month. Following more than a month of investigation in the wake of the Feb. 20 shooting at a home in the 1100 block of West 11th Street, police announced the arrest of Sengchan Houl, 35, in connection with Hwang’s slaying. 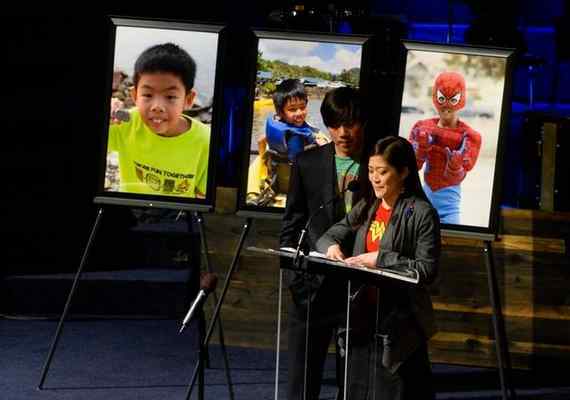 The drive-by attack took place as Hwang and his family were dinner guests at the home of another family, according to Pomona police Lt. Eddie Vasquez. Officers took Houl into custody without a struggle in an unincorporated county area near Pomona shortly after 11:490 a.m., according to police and Los Angeles County booking records. A motive in the deadly shooting has not been disclosed. No further details regarding the arrest were released Sunday. “Detectives are still actively working this case and we are not releasing any additional information at this time,” according to the police statement. Gunshots struck the same home in January, resulting in no injuries, and again on Saturday morning, police said. Police planned to hold a conference Monday afternoon to provide additional details on the investigation. According to county booking records, Houl was being held in lieu of $2 million bail pending his initial court appearance, scheduled Tuesday in the Pomona branch of Los Angeles County Superior Court. POMONA >> Two people walked away with apparently minor injuries after a small airplane crashed or made a hard landing at the Fairplex in Pomona on Wednesday evening. The incident was first reported at 6:42 p.m. at the Fairplex, which is just across Fairplex Drive from Brackett Field in La Verne, Los Angeles County Fire Department Dispatch Supervisor Cheryl Simms said. Details of the incident were not yet clear, however, firefighters treated one person for apparently minor injuries, she said. The single-engine Beechcraft F33A experienced engine failure near Brackett Field, Federal Aviation Administration spokesman Ian Gregor said. “There was substantial damage to the plane, he said. Pomona police officials received no 911 calls reporting the emergency landing, Lt. Alex Rilloraza said in a written statement. “The police helicopter was in the area and advised of a possible aircraft down on the property,” according to the lieutenant. Firefighters also dealt with fuel that was leaking fuel after the incident, police said. The FAA and National Transportation Safety Board are conducting an investigation, officials said. FAA records show the airplane is registered to a Rancho Cucamonga man. The aircraft, manufactured in 1977, has a valid flight status through the end of 2018. The aircraft was heading to Cable Airport in Upland from Selma Airport, Gregor said. POMONA >> A group of men carjacked a big rig containing more than half a ton of marijuana late Friday before leading police to an illicit marijuana grow at a Pomona home, police said. Three men were arrested in connection with the carjacking, as well as on suspicion of cultivating marijuana and possessing pot for sales, according to Pomona police Sgt. Dennis Cooper. The victims of the carjacking were also ultimately arrested on suspicion of possession of marijuana for sales. “Although the investigation is still ongoing, it appears this was possibly a prearranged meeting between both parties and a drug deal gone wrong,” Cooper said in a written statement. The armed carjacking unfolded about 11:45 p.m. at Mission Boulevard and Sorrento Drive, the sergeant said. Officers found the just-stolen truck and trailer a short time later in the 700 block of Washington Ave.
Police got a search warrant for the home and soon discovered 240 marijuana plants growing inside, he said. Arrested on suspicion of carjacking and possession of marijuana for sales were Tyler Brian Holthouser, 25, of Pomona and Xavier Leroy Blackmon, 26, of Victorville, according to police and Los Angeles County booking records. James Holthouser, 34, of Pomona is accused of conspiracy to commit carjacking and possession of marijuana for sales. The two carjacking victims — Timothy Alan Frerich, 39, of Redding and Dennis Young, 40, of Redding — were booked on suspicion of possession of marijuana for sales. Tyler Holthouser, James Holthouser, Frerich and Young were being held in lieu of $100,000 bail each pending their initial court appearances, records show. Blackmon was being held in lieu of $50,000 bail. Anyone with information can reach Pomona police at 909-620-2085. Tips may also be submitted anonymously to L.A. Regional Crime Stoppers at 800-222-8477. ALTADENA >> The Los Angeles County Board of Supervisors on Tuesday renewed a $20,000 reward in the case of a West Covina man whose body was found four years ago on an Altadena horse trail. Marcus Anthony Nieto, 26, was pronounced dead at the scene by coroner’s officials on February 16, 2013 after he was discovered unresponsive by two riders near the 3800 block of Canon Boulevard, officials said in a written statement. He died of “multiple blunt trauma to the head” and the death was ruled a homicide, according to Los Angeles County Department of Medical Examiner-Coroner records. Investigators said Nieto left his home to visit an acquaintance in Pomona, but may have returned to the Covina/Azusa area at some point before he went missing. The reward, originally approved by the board in April of 2014, had expired before Supervisor Kathryn Barger’s motion reestablishing it for information leading to the arrest and/or conviction of a suspect or suspects responsible for the murder. Anyone with information is asked to contact the sheriff’s Homicide Bureau at 323-890-5500. Tips may also be submitted anonymously to L.A. Regional Crime Stoppers at 800-222-8477.